With the European Commission hard at work on the new circular economy proposals, QCEA has joined with 11 other European NGOs to lay out a vision for an ambitious European circular economy package. The circular economy addresses materials (everything from plastic and paper, to precious metals and glass) and products (things made from those materials, from plastic cups to washing machines) throughout the process of their life cycle. Every product goes through a life cycle, starting with its design, mining of raw materials or components, and manufacture, followed by distribution and use, and ending with going to landfill or being recycled. Under our linear economic model, many products have very short life cycles, and many are simply disposed of at the end of the cycle, going to landfill or incineration plants – and polluting our seas, soil, or air. Both short-lived products and premature disposal mean that resources are not used efficiently, causing excessive waste. The circular economy aims to address these issues, improving efficiency of our resource use. In order to set European businesses on the path towards a true circular economy, the European Union must bring forward a holistic proposal, taking four separate and closely interlinked areas into account. These are: material management, toxics, chemicals and health, energy efficiency, and economic incentives. 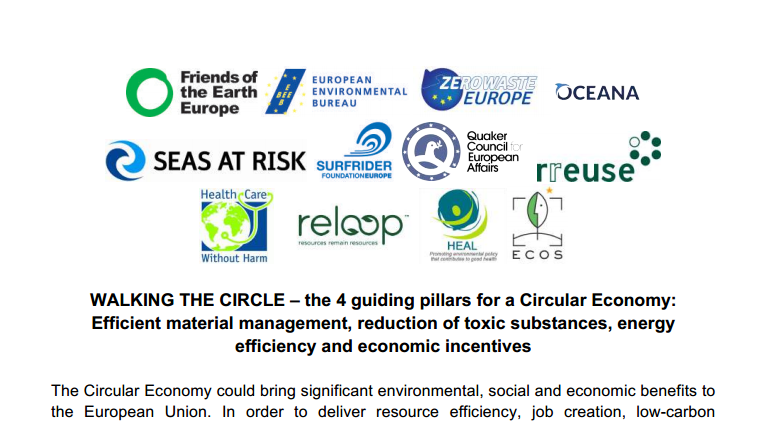 It is vital that the EU’s proposals address all of these areas, and our entire system, as the circular economy necessitates a fundamental change in our economic model. Any half-baked proposal will fail to bring the full range of system-wide benefits needed to have a truly sustainable way of life. Europe needs not only to be more resource efficient, but to consume fewer resources overall. To achieve the greatest reduction in our resource consumption, we must change not only the way we deal with waste, by aiming to eliminate landfill, and building up recycling and reuse systems, but the way we design, produce and consume products. For example, at the start of the life cycle, action should be taken to encourage businesses to design products in a way which can prevent them becoming waste, instead facilitating their reuse, repair, or redistribution. At the end of the life cycle, maximum value should be extracted from products through these processes, before, finally, they (or parts of them) are recycled. Economic activity should be guided by the waste hierarchy, prioritising prevention and reuse. Preventing products and materials from becoming waste, at all stages of the cycle, will help reduce waste and pollution due to waste processing or litter, and also lessen the depletion of our scarce natural resources. Take the example of a sofa. Compared with other products, furniture has a comparatively long lifetime but it can still be increased. Imagine your beloved sofa were to break, if repair businesses (or repair cafés) were more widespread, and economically competitive, they could help give your sofa a new lease of life. 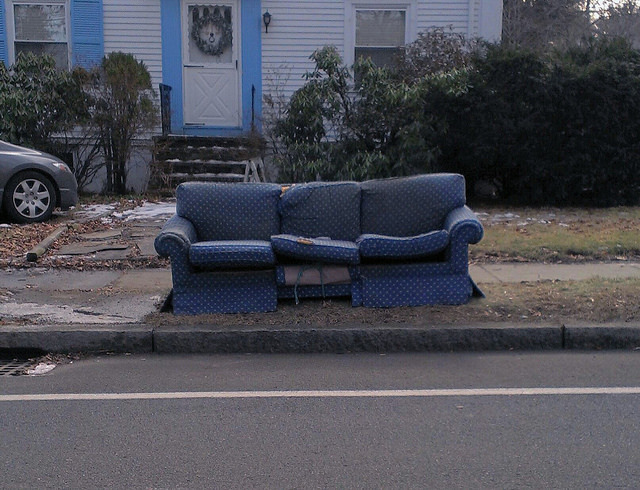 If repair is not possible, or desirable, then the couch could be redistributed using platforms like freecycle or furniture now enabling it to be used by another owner. In a circular economy, the sofa would be designed from the start to be disassembled easily – enabling parts to be replaced and reused separately. The circular economy would also emphasise durability, which for the sofa would mean higher quality materials. As well as increasing the sofa’s lifetime, using higher quality materials would make it easier to repair and recycle, as higher quality textiles are easier to renovate. Did you know that the circular economy can increase energy efficiency too? Many also often forget that energy (along with water, land, carbon and materials) is a resource too, and as such the circular economy can play a substantial role in the EU’s push for energy efficiency. This is because improved material management leads to fewer products becoming waste, thus preserving the energy embedded in them from their production. As well as being environmental policy, the circular economy concerns economic activity, as it will affect business and industry across the production chain. If the EU can make resource-efficient business choices simpler and more economical than wasteful ones, then business models, and the behaviour of individuals, will change accordingly. This can best be done by taxing resources more highly, while reducing taxes or introducing tax allowances for resource-efficient businesses and materials. Did you know that a circular economy also means clean production? Integral to efficient material management and the guiding economic framework is the need for toxic-free production. It’s not immediately obvious that the circular economy cannot work without clean production as dangerous chemicals will make it more difficult and more dangerous to reuse and recycle materials and products. All of these areas are clearly interlinked; efficient material management cannot be maximised without support from complementary chemical, economic, and energy policy, to guide behaviour towards more resource-efficient practices. A safe toxics and chemicals policy cannot be implemented without close management of materials and products, particularly at the design stage, while energy efficiency can only be maximised if we consider the whole process, and embedded energy. Cumulatively, these pillars will bring a raft of benefits, for the environment, for the economy, and for European people. By developing a circular economy that addresses all of these aspects, the European Commission can take a big stride towards a more sustainable, safe, resource and energy efficient economy, which benefits both people and planet. You can read and download the full paper here.